← Russian News From Russia: September 18th, 2009! Recipe From Russia: Simple Radish Salad! One thing that Russians grow lots of and love to eat is radishes. So While traveling the countryside of Russia in the summer you can always find a babushka selling radishes in a local village. These radishes are huge and bright red. They are very delicious with a sprinkle of salt and eat them plain. 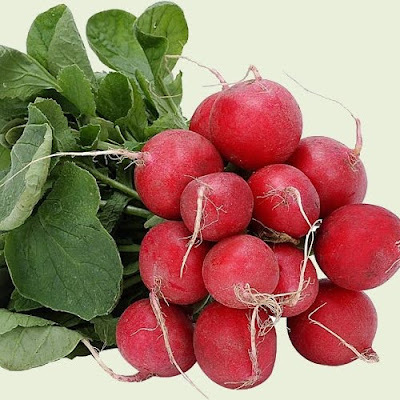 But since you can only eat so many plain radishes – here is a recipe that makes a delicious salad from radishes. The greens from radish tops. Peel red skin from radish, soak in salted cold water for 30 minutes then finely grate into a bowl. Peel onion then finely chop up the onion and put with radishes in bowl. Add salt, sour cream and stir thoroughly. Then take greens (leaves) wash well and strip the stem out of the leaf. Chop up the greens and put in the same bowl. Then finish mixing only enough to get leaves covered with sour cream. That is it and it may be eaten right now or you can put in the refrigerator for an hour and let the flavors mix. Even a non radish lover may find this a good treat!